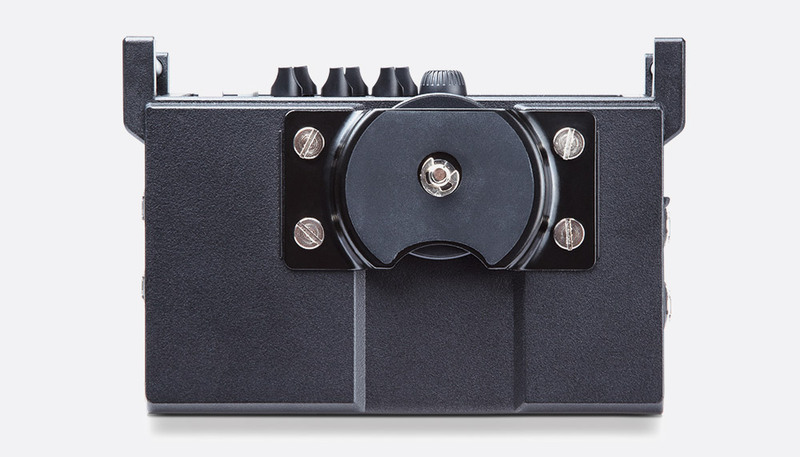 The PMD-706 is a six-channel, SD card, recorder, designed to work with and be attached to a DSLR camera via a standard, quarter-inch, threaded stud which screws into the camera tripod bush. A threaded bush is provided on the base of the recorder for mounting on a photographic tripod. 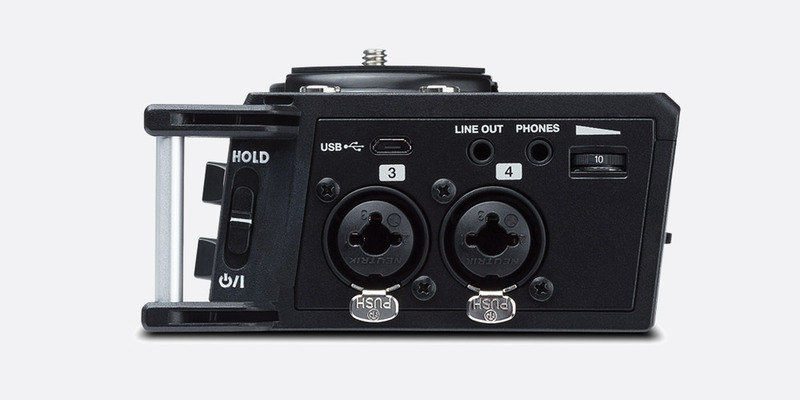 With four combination 3-pin XLR/6.35mm jack connectors for input channels one to four, and two inputs using 3-pole 6.35mm jacks, all of which can be supplied with 48V phantom power, the recorder can record up to six tracks simultaneously as well as a 'Dual-Record' function that creates up to three 'safety tracks' at a reduced level to help with peak levels for critical use. A 'Camera In' monitor input, using a 3.5mm 3-pole jack, allows the user to input a source such as that from a DSLR output so that the signal can be mixed with other audio sources. A final 'External Input' input, again a 3-pole 3.5mm jack, can be used to connect to an additional external audio source. 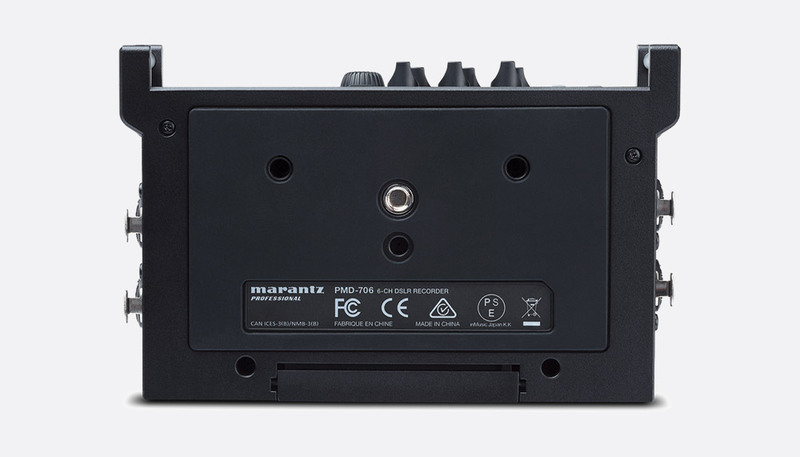 Audio outputs include a 3.5mm stereo jack headphone output with separate thumb-wheel volume control can be used to monitor the incoming signal or the audio playback and a separate 3.5mm line-out jack socket that can be used to connect the PMD706 to an external device for playback or recording the sum. 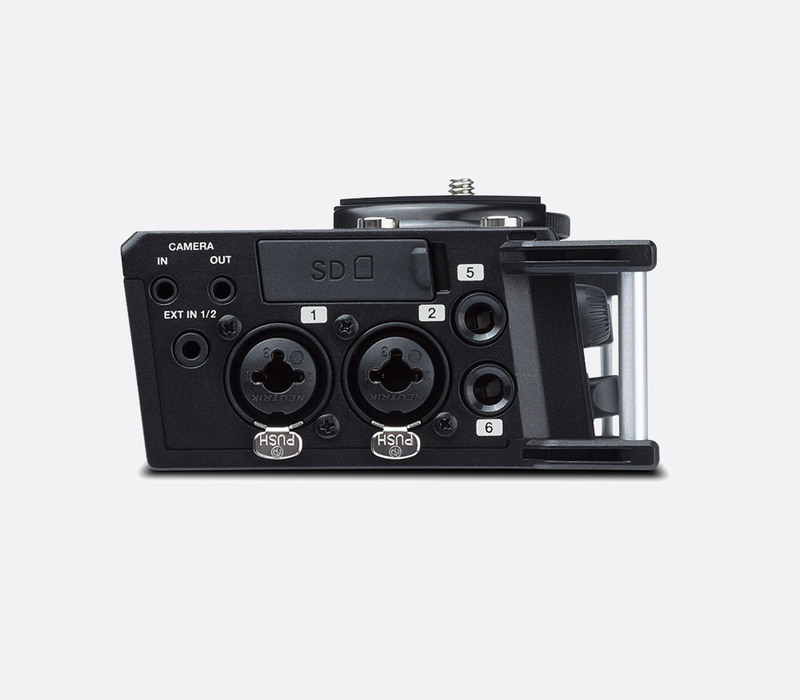 A 'Camera Output' socket, a 3.5mm 3-pole jack, can be used to link the device to the audio input of the camera - useful when using external microphones to improve the capture beyond the capability of the microphone system of the camera, or when mixing multiple audio sources into a single output. The level of this output can be adjusted in the 'output control' menu. The front facing panel of the PMD706 houses six rotary, input-gain controls for input channels 1-6 as well as individual LED peak indicators. A screen, which is positioned to the left of centre, displays the input levels, output levels, battery life, time, and record time as well as the menu function lists that can be accessed and navigated via a 'Menu' button and jog-wheel. Five multi-function buttons give transport control and channel selection whilst a sixth button is dedicated to channel 6 selection and a larger dedicated record button are positioned for ergonomic use. Finally a 'Slate' button can be pressed and held to mark a track with a generated slate-tone for audio video alignment post recording. The unit can be powered with four AA battery cells (alkaline or Ni-MH), USB bus power, or a USB power adaptor. When 48V phantom power is turned off the PMD706 can run up to 5.5 hours when using batteries. A sliding power switch which is positioned on the right side of the unit can be slid down to power on/off, whilst sliding up to the 'Hold' position disables all function buttons to prevent accidental adjustments. Included accessories: SD card, Micro-USB cable, 2x cables (female XLR - 3-pole 6.35mm jack), user guide, manual. Supported media: SD card (64MB - 2GB), SDHC card (4GB - 32GB), SDXC card (48GB - 128GB). Dimensions: 51 x 109 x 165 (H x W x D) mm. Weight: 54g.